- Mary Claire sends me a text that says "I'm heading to Janie Lou"
- I think to myself Can it be...did Cotton + Steel come in? Pop over to Instagram and there it is...a stack of cardboard boxes. Which to a non-quilter might look like the strangest thing to photograph; but to a quilter, especially one waiting for Cotton + Steel, this is Christmas in July. - Zip out the door for "lunch" and 5.1 miles (15 minutes) later I arrive, when who should I see there but Mary Claire of course, and a few minutes later Laura. [Mary Claire & Laura are 2 of the 8 ladies in my LouBee quilting bee]. Clearly some of us were stalking social media. 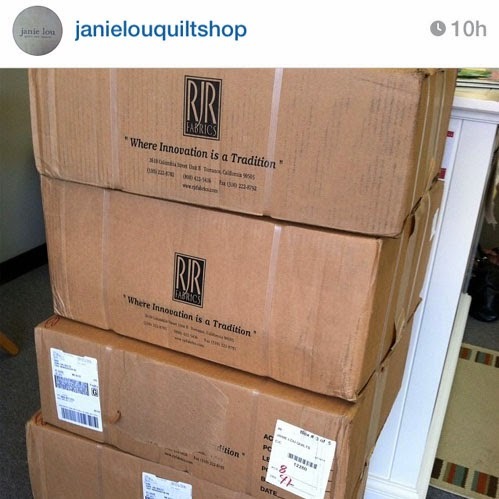 Jane and Jenny, Janie Lou's fabulous owners, are frantically adding the bolts into their inventory; while we Ooohhh and Aaahhh over fabric that until now the vast majority of quilters have only seen online. We quickly started making piles of what we wanted cut...a FQ of this, a 1/2 yard of this, 1 yard of this, so on and so forth. 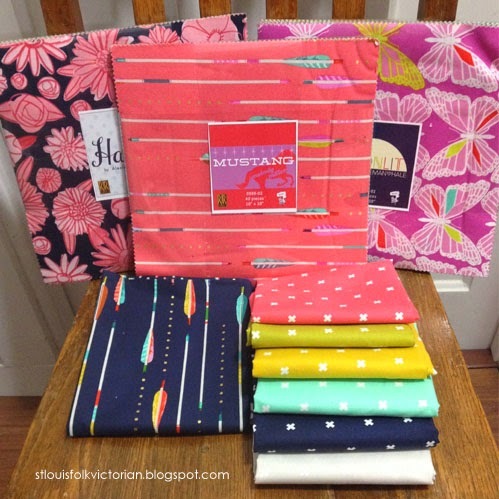 I can definitely see myself popping back in to buy a FQ here and there, or a 1/2 yard of something for a binding, overall I am very pleased with my small lunch-break assortment and am glad that I waited to see the fabric in person. While I could have pre-ordered the fabric online like many people did; I have been burned in the past when I let hype and frenzy run my pocketbook. Besides, getting to spend an hour or so with some quilty friends in my local quilt shop was an unexpected and exciting surprise. Do you have plans to buy Cotton + Steel? Oh, that fabric with the arrows is amazing! I may have to get some and do something for my little sister - she's an archer and I know she'd love it. Didn't pick up any of the basics. Will have to go back for them. So cool! Im so glad you captured this moment. Like we were saying it's not very often anymore that as grown adults, we get to experience a craze or something so exciting. I had so much fun running to the shop and talking to Jane and Jenny while shopping with you guys! Loved it! Oh, yes, I have been waiting for these. I especially like the arrows (from Mustang?). Going to make a stop at Janie Lou's on Tuesday after breakfast.